12 What’s the Purpose of a Hedge Trimmer? Caring for your yard is a vital consideration, particularly when it comes to trimming hedges and shrubs. Whether you’re recreating the look and feel of a traditional English garden, are opening your own lawn care business, or you just need a convenient way to make sure your boxwoods stay in good shape all year long, the following hedge trimmers can help. We’ve compiled a list of the 10 best hedge trimmer models on the market today – take a look below. As you can see from the chart above, there are quite a few capable hedge trimmers on the market, although they do vary a great deal in terms of capabilities, cut length, maximum cut thickness and more. In order to really make an informed decision regarding your yard care needs, you’ll need to know a bit more about each of the best hedge trimmer models we’ve chosen. We’ll discuss everything you need to know below. 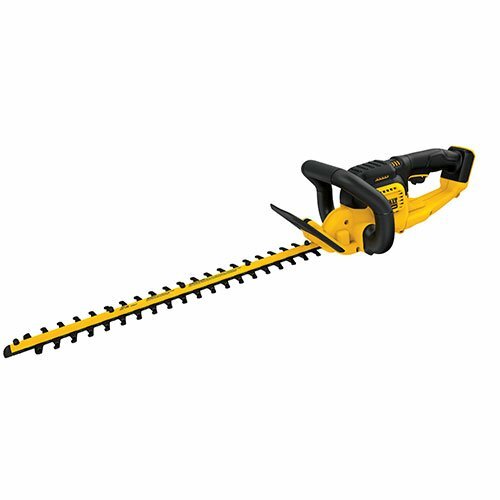 This DeWalt hedge trimmer offers excellent performance and good reach. With a maximum cutting thickness of 3/4-inch, you can trim even larger branches, without sacrificing the ability to trim leaves and smaller stems. The 22-inch laser cut allows you to reach to the far side of even larger hedges and shrubs with ease. This trimmer weighs under eight pounds as well, which means that there is less arm and hand fatigue when using it. The 20-volt battery system offers high-performance and plenty of use life, as well. Note that the tooth blade design is hooked, and the teeth are made from hardened steel for better durability and less need for sharpening. The trimmer does not come with a battery or a battery charger. A packaged option is available, though, and the trimmer will work with any other DeWalt 20-volt battery. Because the battery is a lithium-ion type, you get full performance from the trimmer even with a partial or low charge (no performance degradation as the charge depletes). 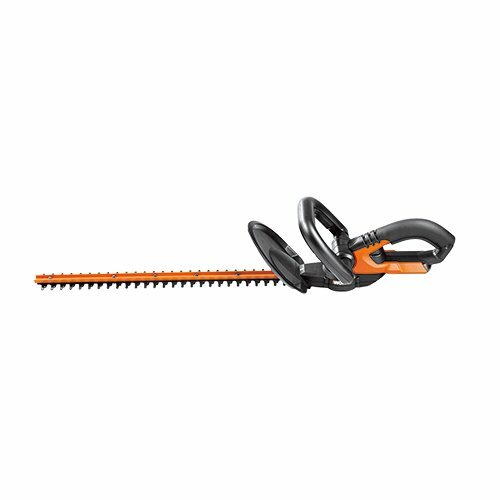 The Black + Decker LHT2436 is a powerful hedge trimmer based on 40-volt battery technology. It offers a maximum cut thickness of 3/4-inch, which means that you can handle even larger branches and stems with ease. The teeth are not hooked, but are flared at the ends, and the blade actually shears (like the way scissors operate), rather than cutting like a straight blade or chainsaw. The D-shaped handle is ergonomic and comfortable, and can be gripped easily from almost any angle. The addition of the front security handle reduces strain on your arm and ensures easier operation, as well. Note that the safety guard at the back of the blade should remain in place to protect against flying debris. With a full charge on the lithium-ion battery, this hedge trimmer delivers the ability to trim 6,000 square feet of hedges or shrubs. Note that the battery is included with this item, although another option is available for a lower price for those who already have a compatible 40-volt battery. The EGO Power+ hedge trimmer features 56-volt battery technology, and one of the longer blades on our list of best hedge trimmer models. It reaches an impressive 24 inches, meaning that even very tall or very wide hedges and shrubs will not pose a problem. The shearing action of the blade can handle stem/branch thickness of up to 3/4 of an inch, so you can tackle even mature plants. The blades themselves are made from hardened steel, which ensures better durability, and will hold an edge longer, meaning there will be less need to sharpen them over time. One of the most interesting features of this trimmer is the inclusion of an electronic brake to help immediately stop the blade. The motor is capable of reaching 3,000 strokes per minute, which means greater cutting power and speed, and the unit comes with a full three-year warranty, as well. Note that this model does not ship with a battery, but two optional kits are available with batteries (standard or extended life). One of the most versatile hedge trimmer models on our list, the GARCARE pole and portable hedge trimmer offers powerful performance and more. However, note that this is a corded model, which means that you will need to connect it to an extension cord and a power outlet in order to use it. It does not accept batteries. This trimmer features a 3/4-inch cutting capacity, so it can handle larger tasks, and the blade is a full 20 inches in length. However, the most important feature of this unique hedge trimmer is that the head features six positions of adjustability, going from 90 degrees to 45 degrees to 0 degrees, to 45 degrees to 90 degrees. This ensures that you are able to easily trim your hedges and shrubs at the perfect angle to achieve the look and fullness that you want. The included pole is made from lightweight aluminum and is a full nine feet long, extending your reach immensely. Note that it’s necessary to use a shoulder strap when also using the pole due to weight and encumbrance. The WORX WG 255.9 PowerShare Cordless Hedge Trimmer offers plenty of power and performance, as well as some innovative features not found on other models. The 20-volt battery system ensures robust, reliable performance, and the trimmer only weighs six pounds, which greatly reduces fatigue and muscle strain during use. The 9/16-inch cutting width is slightly narrower than some other models on our list, though, which is one reason it is not closer to our top choice. The blade is 20 inches in length, though, which offers decent reach for standard uses. With that being said, those who need improved visibility will appreciate the clear safety guard on this hedge trimmer – it allows you to see through the guard so you can accurately gauge blade position during use. Note that this model does not include a battery or charger. However, there is an optional kit that does ship with both a single 20-volt battery and a charger for an additional fee. 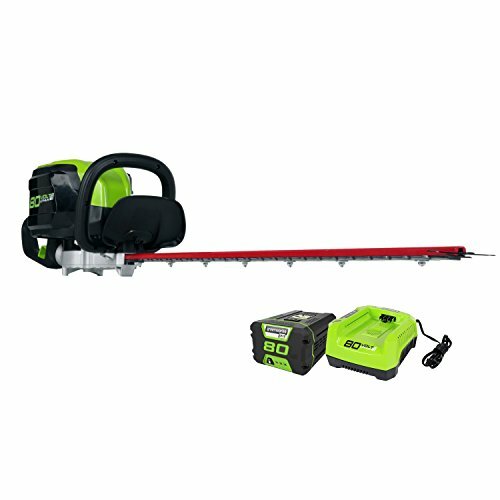 Another hand trimmer/pole combination, the Greenworks 22342 is a good option for those with standard to light trimming needs. 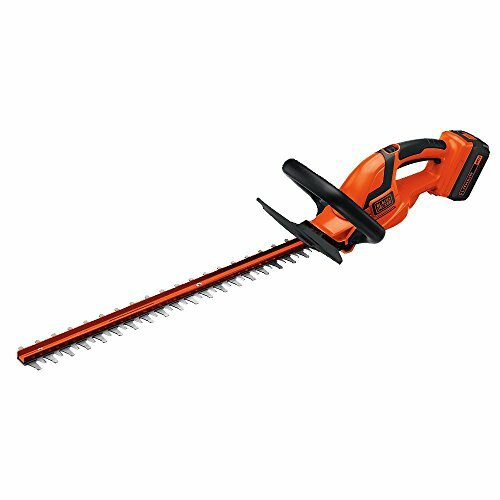 While most of the hedge trimmers on our list have a maximum cut thickness of 3/4-inch, this model maxes out at 5/8-inch, which is slightly narrower. However, there are some interesting features that might make this a very appealing addition to your power tool selection. One of those is the inclusion of a shaft that can extend up to six feet in length. The head also pivots with three different positions to ensure that you always get the right angle. The 40-volt battery offers up to 50 minutes of use time on a full charge, as well. Note that this particular model does not include a battery or charger, but there is a kit available that does include both for an additional cost. Don’t need an extendible handle? 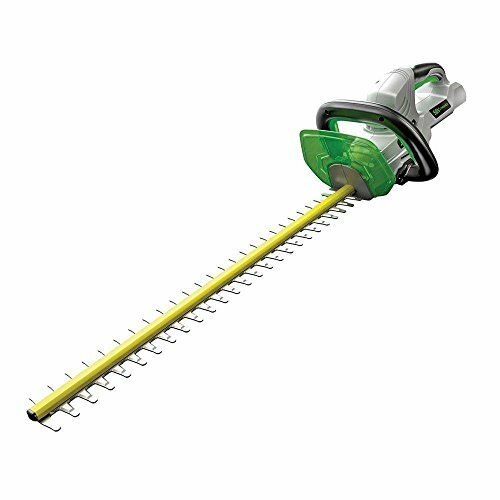 Then this Greenworks hedge trimmer might be a better choice than the pole-based model we discussed above. It offers a longer blade (26 inches), as well as a 3/4-inch cut, rather than 5/8-inch, so it’s a better choice for those with more serious trimming and cutting needs. The steel blade features dual action shearing, and is made from hardened steel for better durability and less time spent sharpening. One of the most interesting aspects of this trimmer is the fact that the rear handle rotates a full 180 degrees, ensuring that you can maintain good control and a comfortable grip even in demanding trimming conditions. Note that this trimmer uses a 80-volt lithium-ion battery that is part of Greenworks’ G-Max line. There is a battery included with this particular trimmer, but there is a option to buy this same trimmer without the battery. 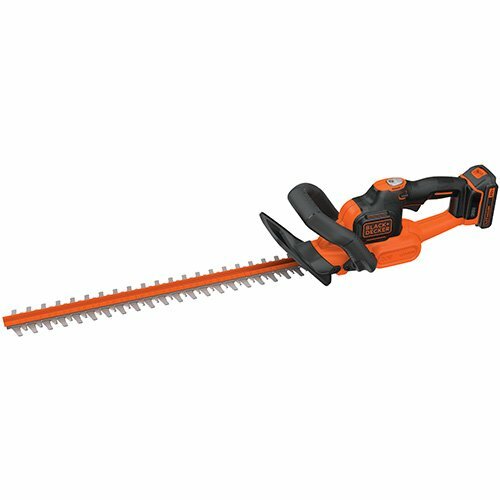 Backed by the Black + Decker name, and including a battery, this is one of the more popular hedge trimmer models on the market today. The D-shaped grip is ergonomic while ensuring excellent control at all times, and the trimmer features a 3/4-inch maximum cut. The blade is a full 22 inches in length, and is designed to reduce vibration during use, which helps to cut down on muscle strain. The Powercut system built into this trimmer also offers an interesting difference to other trimmers we’ve included. In most instances, jams mean stopping what you’re doing to remove the stems and leaves blocking the blade action. With the Powercut system, you simply need to press a button and the blade receives a surge of power to clear the jam without you having to stop work. 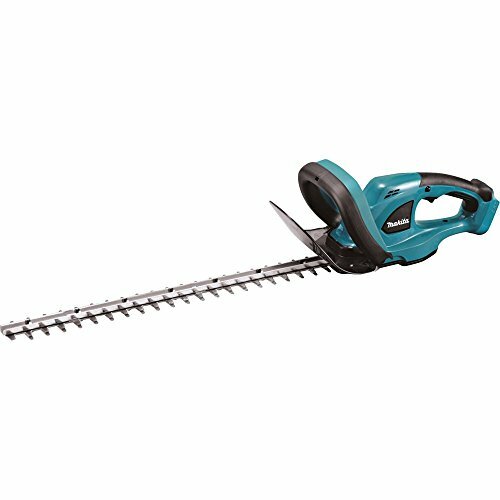 If you’re in the market for a basic hedge trimmer, the Makita XHU02Z might be the right choice. With a 22-inch blade and a 3/4-inch cut max, it is pretty capable. However, the motor only produces 1,350 strokes per minute, which is less than half the capacity of the EGO model mentioned higher in our rankings. With that being said, there are some benefits with the Makita. For instance, it’s one of the quietest models on the market, producing only 87 dB(A) during operation, which is a reduction of 25% compared to comparable units. The blade features antivibration technology to make using the trimmer more comfortable, and there is a low battery warning light, as well as an auto-stop feature that turns the trimmer off when the battery charge gets too low. Note that this model does not ship with either a battery or a charger, but there is an upgrade kit available for an additional charge. The Milwaukee 2726-20 hedge trimmer might come at the end of our list of the best hedge trimmers on the market, but that doesn’t mean it’s without any benefits. It features a blade that’s 24 inches long, and has a maximum cut thickness of 3/4-inch. It also weighs in at just over 8 pounds, making it relatively lightweight and easy to use. The trimmer comes with a full three-year warranty, as well, which is not something available with some other models on our list. There’s also a blade tip guard to help prevent damage to the blades, as well. The lithium-ion battery offers up to 120 minutes of run time on a full charge, and the body’s design was inspired by the needs of professional landscapers. Note that this model does not ship with a battery or charger, nor is there an upgrade kit available. As you can see, there are plenty of hedge trimmer models out there, and they all bring something slightly different to the table. Choosing the right model for your needs will require that you know a bit more about the various features and functions we outlined above. Below, we’ll discuss what you need to know prior to investing in any hedge trimmer. What’s the Purpose of a Hedge Trimmer? Hedge trimmers are power tools specially designed for, you guessed it, trimming hedges. They can be used for shrubs and other trimming needs, as well. They’re relatively versatile, but they cannot serve in a number of more specialized roles. For instance, while they can cut through leaves, stems and small branches, they are not the equal of even a small chainsaw, or even a good pair of clippers or a decent handheld saw. With that being said, they’re excessively good at maintaining hedges and shrubs, and keeping a razor-sharp pruning line. Whether you operate a lawn care or landscaping business, or just want to make sure that you’re able to keep your own yard in great condition, hedge trimmers are going to be a vital consideration. With that being said, there’s a lot of disparity out there on the market in terms of power, capacity, capability, and even included features. Making an informed decision will require that you know a bit more about how to determine your own needs, about the various types of trimmers on the market, and more. While all hedge trimmers offer similar functionality and are designed to accomplish similar goals, there’s a lot to know about the various types on the market. Battery powered hedge trimmers are the newest type on the market, and they’re the most versatile and easy to use, as well. Most of the models we discussed in our list of the best hedge trimmers were battery powered, with a couple of exceptions. The reason for this is that modern batteries offer plenty of power and performance for the average homeowner, and with 18, 20, 40 and even 56-volt systems on the market, you get not only excellent power, but plenty of run time. Most homeowners will not have more than two hours’ worth of hedge trimming to accomplish. With that being said, battery-powered trimmers do have a few drawbacks. For instance, the battery can increase the weight of the trimmer, and there’s certainly the need to make sure that your battery is charged, which can take an hour or more itself. Then there’s the fact that battery-powered options may not have quite the same operating duration as other models, particularly those with gas-powered engines. Still, the average homeowner will likely need that level of performance only rarely, if at all. Corded electric hedge trimmers are very popular with homeowners, and can be used with both small and medium-sized yards. They’re quite powerful, and do not have the usage limits of battery-powered models. They are quieter than gas-engine models, and even quieter than some battery-powered trimmers, too. They have no emissions, and starting them is a snap. Of course, there are some (obvious) downsides to going the corded route. The primary one is seen in the name of this tool itself. They’re corded. That means they need a constant connection to your home’s electrical system in order to work. Because you’ll be out walking around your yard, this means you’ll need an extension cord, possibly more than one if your yard is large, or if you have a lot of separate hedges that need to be kept in shape. Gas-powered hedge trimmers are the oldest style on the market. They’re also the most expensive out there. With that being said, they offer outstanding performance, and can be run continuously (as long as you have plenty of oil/fuel mix to keep them going). 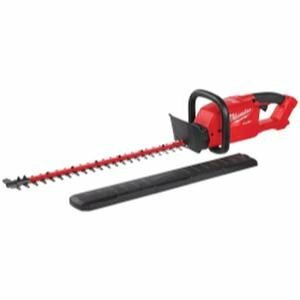 They offer faster trimming, and often have better cutting capabilities than battery-powered and corded hedge trimmers. You can also use them in damp weather (a little rain won’t hurt these, but it will play havoc with electric models). Gas-powered trimmers do come with some tradeoffs, though. We’ve already mentioned that they are more expensive. They also need more in the way of maintenance and care. There is also the fact that you must deal with exhaust from the engine, the noise created during operation, and more weight while using the trimmer. They’re even more expensive in the long run as well because of the oil and fuel they consume. You’ll find long-reach/pole trimmers available in battery, corded, and gas-engine formats. While the power source may differ, these trimmers share some pretty specific similarities. They include both a conventional trimmer, as well as an extendible pole. The pole may be built into the body, or it might attach to the trimmer when needed. These are useful for reaching areas higher up that need to be trimmed, and can help you avoid having to haul out a ladder for those hard to reach areas. Now that you have a better idea of the various types of hedge trimmer on the market, let’s take a closer look at one of the most crucial considerations – the blade. Power, handling and ergonomics are all important considerations when choosing a hedge trimmer, but when you really get down to brass tacks, the blade is probably the most crucial element. After all, the blade is what does all the cutting and trimming. You could have a very powerful motor, and the most ergonomic grip in the world, but if the blade is the wrong type, your results will suffer. Here’s what you need to know about hedge trimmer blades. You’ll notice that none of the hedge trimmer models in our best of list at the beginning of this guide were single blade models. There’s a reason for this. They’re not very common. With that being said, there is more safety when using a single bladed trimmer, because there is only one cutting edge to worry about. They’re easier to maneuver, and it’s easier to avoid cutting yourself on the blade, as well. Most hedge trimmer models on the market today use a double blade. This is actually a good thing because, while not as safe as a single blade, double blade trimmers offer better performance and are easier to use. You can cut going in both directions (and both sides of the blade cut no matter what direction you’re going), which saves you time and effort. Left-handed users will likely find a double blade better for their needs, as most single blade models are designed for right-handed users. Blade length is of critical importance. We’ll break this down into subsections for better understanding. Short: Short blades are generally around 16 inches in length. You’ll notice that none of the trimmers we included at the beginning of this guide had blades that short. That’s because these are useful only for light-duty tasks, and handling small to average hedges. Medium: Medium-sized blades are usually around 18 inches in length. These are good for handling average size hedges without any trouble. Again, none of the trimmers we’ve covered had blades this short. Long: Long blades are those that reach 20 inches or more. These can handle large to mature hedges, and can be used equally easily by professionals and homeowners. All of the hedge trimmers we covered previously had blades at least 20 inches in length, some measuring as long as 24 inches. Blade length is important for one thing – reach. The longer the blade, the farther and deeper you can reach. If you have a short blade, it’s possible that you might have to trim the hedge from both sides. In the case of mature hedges, you may not be able to reach the entirety of the hedge top even from both sides with a short blade. It’s always better to go with a longer blade than what you need, because hedges grow and widen over time. Buying a longer blade now means that you will not have to upgrade in the future. Note that blade length has an opposing correlation with control. That is, the longer the blade is, the more difficulty you will have with fine control and precision tasks. You can make up for some of this tradeoff by opting for a lighter trimmer model. Finding the right hedge trimmer requires doing more than just comparing blade length, battery capacities and power types, and other features. You need to make an informed decision based on your property itself. In this section, we’ll help you determine how to do that. Power: Power is one of the first considerations that you’ll need to make. Base your power needs on the size and maturity of the hedges that you need to trim. The thicker the branches you’ll need to cut through, the more power you’ll need. To get an idea of power with a battery-powered or corded trimmer, you’ll need to consider things like strokes per minute and maximum cut thickness. Weight: Weight is a huge consideration when buying a hedge trimmer. You need to think about the size of your property and the amount of trimming that you need to do. The more trimming you have to do, the longer you’ll need to hold the trimmer up. Even a relatively light model can get very, very heavy over time. Noise: Unless you live in a rural area, you’ll need to consider noise production during lawn care and maintenance. A gas-powered trimmer is going to be very loud, on par with a gas-powered weed trimmer. Both corded and battery-powered trimmers offer very quiet operation, making these great choices for use in neighborhoods, or just if you don’t like having to wear ear protection while maintaining your yard. Property Size: The size of your property is one of the more important factors that will figure into your purchase decision. If you have a small property, you can likely get away with almost any type of trimmer, so long as it has enough oomph to take on your hedges. However, if you have a larger property, you will want to make sure that you have a trimmer that’s capable of handling your needs in one go. That may mean a longer extension cord (or combination of cords), or it could mean a high-capacity battery or buying more than one battery. Property size also plays into weight, as you’ll need to carry that trimmer around for longer periods with a larger property. Use Frequency: How often do you plan to use your trimmer? The more frequent your use, the more durable you’ll want your tools to be. That speaks to things like build quality, motor type, battery technology and, of course, warranty. There are plenty of different features available with today’s hedge trimmers. Some of those are vital, and some are just “nice to have”. Below, we’ll cover the most important features to look for when making a purchase. Lightweight Construction and Good Balance: We touched on weight in the previous section, but it’s so important that it needs to be mentioned again. Remember that you’ll be using your trimmer with both arms, often with them both extended well in front of you. Look for a hedge trimmer that is light and well balanced so that you can avoid muscle fatigue and strain, and use the tool safely. Pivoting or Rotating Head: A pivoting or rotating head is an important feature for many (but not all) homeowners. This allows you to more easily handle vertical edging, as well as curved edging. If you do not need to worry much about either of those, then this is a less critical feature to look for. Wraparound Front Handle: While very small hedge trimmers might be usable with just the D-handle at the back of the unit, that is not the case with longer models like those we’re discussing within this guide. You’ll need to use both hands to ensure safety while operating your trimmer. There are two options here – one style uses a balled protuberance at the front for grip, and another offers a full wraparound handle. The wraparound handle is the better option, as it ensures that you can get a good grip no matter how contorted you might need to get in reaching areas to trim. It also offers better ergonomics and better control. Pigtail: If you’re using an electric trimmer, you’ll need to connect it to an extension cord to run it. A pigtail is a short length of cord that sticks out the back of the trimmer. Some models do not have this, and require that you plug the extension cord into the body of the trimmer. A pigtail is always a better option. It makes connecting your trimmer simpler, and the pigtail can be tied around the extension cord for a more secure hold. Blade Brake: There will be times that you let go of the trigger on your trimmer, sometimes accidentally. A blade brake helps make sure that these instances don’t turn into unfortunate accidents. A blade brake is exactly what it sounds like – an automatic brake that kicks in to stop the blade from moving instantly. Blade Guard: Hedge trimmers create a lot of debris – small pieces of leaves, twigs, stems, and even chunks of branches fly off that blade while it’s in operation. While much of that debris will fall to the side, it can also fly back toward you. A blade guard sits between the back end of the blade and the wraparound handle, preventing you from being pelted by debris while you work. Dual Switches: Safety is a big consideration with hedge trimmers, particularly if you’ll be using one where children might pick it up. Dual switches (one in the handle, and one on the wraparound front handle) ensure that no one can accidentally turn the trimmer on. Lock On: A lock on feature does exactly what it sounds like – it allows you to use the trimmer for extended periods without having to press the trigger down the entire time. This can help you avoid additional fatigue. While hedge trimmers might be pretty specialized pieces of lawn care equipment, they’re necessary for anyone who has hedges or shrubs in their yard. The right trimmer will help you keep that “just pruned” look, ensuring that your yard always looks its best. However, there are many different types of trimmers on the market. Electric trimmers (battery and corded) are better options than gas-powered models in most cases, but even between those two types, you have a lot of considerations before making a purchase decision. This guide not only lists 10 of the best hedge trimmers on the market, but walks you through the considerations you’ll need to make when buying a trimmer, as well as the most important features to look for when shopping.